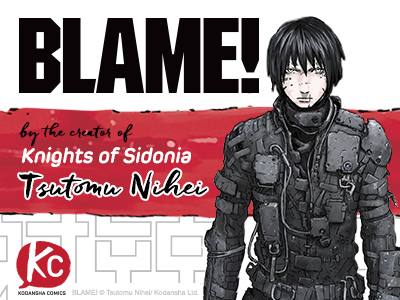 Originally published by Tokyopop, then long out of print, Tsutomu Nihei's (Knights of Sidonia) cyberpunk gamechanger BLAME! is now back in digital and in a luxurious new premium print edition courtesy of Vertical Comics. Read all of the scintillating Chapter 1 here. Check out our other long-out-of-print "Resurrected" Kodansha re-releases—now on sale through September 20. And if you missed the BLAME! anime trailer debut at this year's San Diego Comic Con—introduced by manga's preeminent science-fiction master himself—check it out here.